Hi everyone.. I hope you are having a great weekend! 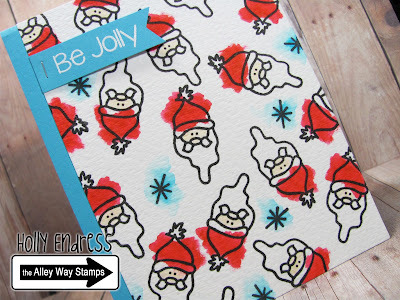 Today I have a fun card using the newest sets from the Alley Way Stamps Mistletoe Kisses and the free set Chilly. Chilly is free all month long with any $40 purchase. I stamped the Santa image several times onto a piece of watercolor paper using some VersaFine Black ink and then I added some color with a Zig Clean Color Real Brush pen. I added a little water to wash the color out some with a water brush and then I trimmed about a 1/4" off the panel and added it to a turquoise top folding card base. And then I stamped the sentiment from Chilly onto a piece of the Turquoise card stock and heat embossed it in white. I added it with a tiny staple. Head over to the Alley Way Stamps blog for more fun inspiration using this Month's new Release!